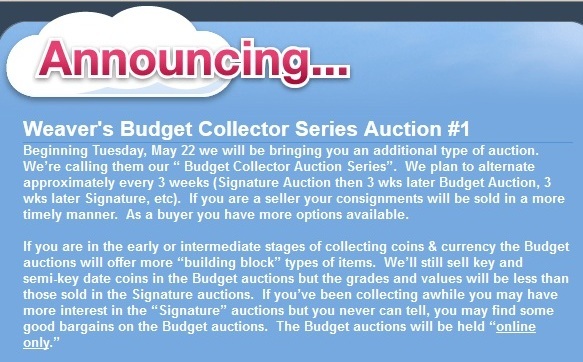 Weaver Signature Coin and Currency Auction plans a series of budget collector auctions especially geared for beginning and youth hobbyists or bidders with modest expendable incomes. These will be live auctions rather than timed ones, she added. All of our auctions are “live” rather than timed but the budget auctions will not include in-room bidders. We will operate everything including the auctioneer as usual without the in-room bidders. She noted that her auction house likes shipping specials “as they greatly decrease the labor on our end (no looking up individual costs). They generally end up as a break-even deal. Proxiblog applauds the Weavers for scheduling budget auctions. The house typically leads our rankings to the right, based on innovation and customer service. This new initiative focuses on a special kind of bidder. As Cheryl Weaver noted, “Not all of our buyers have deep pockets.” Dave notes that “there are a whole lot of buyers out there that can afford a semi-key date Morgan as example, in Fine rather than Mint State.” We have been able to offer some wonderful items on our Signature auctions and will continue to do so. This entry was posted in News and tagged American Numismatic Association, Auctioneers, AuctionZip, Best Practices, Cheryl Weaver, Coin Auction, Dave Weaver, iCollector, National Auctioneer Association, Proxibid, Proxiblog, Weaver Signature Coin and Currency Auction. Bookmark the permalink.